June 2012 – We had only one snowfall in the winter of 2011-2012 but one was enough to help us confirm that we have rabbits on our Richard G. Croft Memorial Preserve in Goshen. What’s the big deal about rabbits? The species that we confirmed at Croft was the New England Cottontail (Sylvilagus transitionalis), which is far more rare and elusive than the common Eastern Cottontail (S. floridanus). 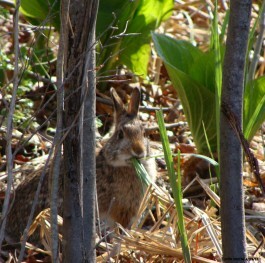 Although the New England Cottontail is not yet an endangered species, it is in danger of becoming endangered. Connecticut Audubon Society is now in a great position to help them thrive again. For several years we’ve been using federal grants and a team of volunteers and staff to manage and expand a pocket of scrub and shrub thicket on Croft, in hopes of improving the habitat the New England Cottontails need. But New England Cottontails are not only elusive, they are virtually impossible to identify without DNA testing, and for that we needed droppings to analyze. Rabbit droppings are easiest to find in the snow, so last January, after our only snowfall, Robin Blum, a wildlife biologist from the Connecticut Department of Energy and Environmental Protection, traipsed into the sanctuary and came back with the goods: two pellets, which tests confirmed were from a New England Cottontail. Our habitat conservation efforts worked! The scrub-shrub habitat we created is in the middle of the 800-acre Croft sanctuary, and our best guess is that maybe a dozen individual New England Cottontails live there. We’re working on a plan to expand the scrub-shrub habitat at Croft to about 15 acres, and we’ll be applying for grants through the Natural Resources Conservation Service’s Wildlife Habitat Improvement Program to help pay for the work, so the cottontails don’t peter out. The work will also be a benefit to a host of declining bird species, such as Blue-Wing Warbler, Chestnut-Sided Warbler, Prairie Warbler and Brown Thrasher – that need scrub-shrub habitat. While we’re trying to help New England Cottontails at one preserve, we’re trying to stop mile-a-minute weed from taking over at two other preserves, the John W. Field and John Mahoney Sanctuary in Fairfield, and the H. Smith Richardson Wildlife Preserve in Westport. Invasive and – as its name suggests – fast-growing, mile-a-minute weed (Persicaria perfoliata) arrived in the United States in 1930. As usual with invasive species, it got here by mistake, in this case with a batch of holly seeds brought to Pennsylvania from Japan. It has since spread to about a dozen states. Connecticut Audubon Society has been working on this project with Donna Ellis, senior extension educator at the University of Connecticut. Earlier this month, she and her assistants released about 50 weevils on a small patch of mile-a-minute at the Field preserve and about 1,000 in a bigger area of Smith Richardson. We’ll return to the sanctuaries in August and in the fall to assess the results.